Eddy Current Testing, or ECT, uses electromagnetic induction to find flaws and cracks in conductive materials that are otherwise invisible. ECT is primarily used in the service and manufacturing industries where tubing, sheet metal, and other metal products are needed for essential operations. Additionally, ECT uses electromagnetic fields that can detect metal hardness and thickness, heat damage, and more. Eddy Current Testing is typically completed to detect surface flaws and sub-surface flaws in materials. 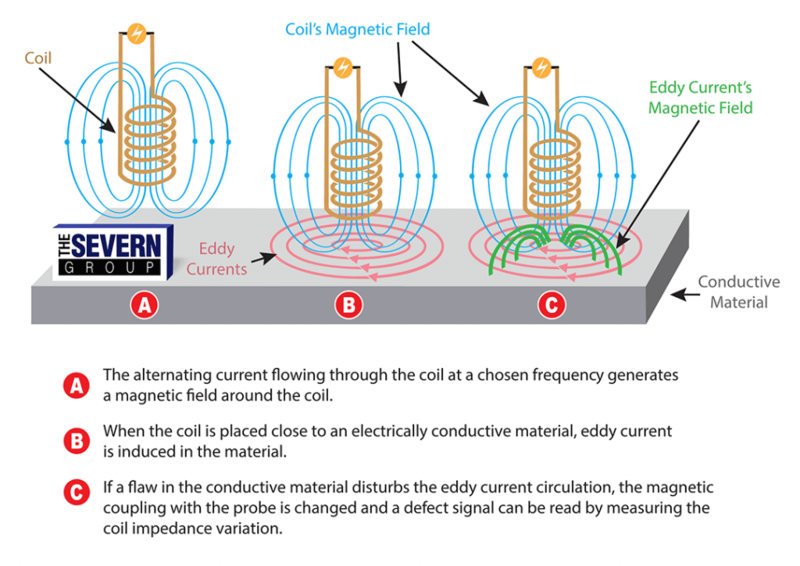 A probe created from conductive wire coil and copper is used to develop an interchanging current flow to produce an oscillating magnetic field. As the probe is placed near the conductive metal surface, the electrons flow in a circular motion. This is called an eddy current. This flow of electrons moves across the metal similar to the way ripples take place on the water. The test material then creates a magnetic field that interacts with the field of the coil. When the probe moves across any cracks or pits on the surface of the test material, the current pattern becomes disrupted. Then, the technician who is conducting the test can tell where the flaw is within the material. Finally, the location of the flaw is detected from a screen. When the instrument sees a change in the magnetic field generated by the eddy currents, it displays a change in the signal on the screen. It is recommended that businesses work with trained and knowledgeable technicians so that the results are understood and evaluated correctly. A good technician will be able to provide the best possible test results despite some conditions of the testing phase being out of their control. If you have questions about this or any other facility management questions about HVAC service, contact us today.